Science Behind Soaking Grains | Why soak your flour? What does it mean to soak grains? Well, besides sprouting and making sourdough, soaking whole grain flour is one way to maximize the benefits found within the grain. The nutrition you find in whole grains is locked inside by three main components, phytic acid, phytates, and phytase. I’m still not fully versed in all-things phytates, phytic acid and phytase and likely will never be. But I do feel well rounded enough to at least share with you what I’ve learned. It’s interesting, that’s for sure. We’re skipping over the whole enchilada versions and heading straight for the chips and salsa. That’s my favorite part of the meal anyway. Phytic Acid: shaped like a snowflake, phytic acid acts like a locked storage container in grains and seeds. It’s found in the bran and germ portion and holds mainly phosphorus, but often times calcium, magnesium, iron and zinc too. Phytates: the “glue” keeping these important minerals inside the storage container. If phytic acid is the locked container, phytates would be the lock itself. Phytase: an enzyme that breaks down phytic acid. This would be the key to our lock. How do we unlock the phytic acid and break free the vitamins and minerals so our bodies can use them? We turn the key. We activate the phytase when we soak the grains. Where do we find phytase? Phytase is found naturally in raw plant foods. But let’s be honest. The mere mention of the words “raw” and “food” together in the same sentence tends to give non-foodie people the heebie-jeebies. It’s also found in the whole version of grains, but levels of phytase begin to drop as soon as whole grains are milled into flour. This means that any non-raw version of whole grains bought from the store (all flours, rolled oats, even most nuts and seeds too) will likely have little phytase left when you’re are home, ready to eat it. Traditionally, a diet rich in raw plant foods and whole grains wouldn’t be an issue when it comes to phytase breaking down phytic acid. It happens naturally in our own digestive system when all parties are present and accounted for. But most of us don’t eat traditionally. The human diet nowadays is comprised largely of cooked foods and processed grains. Any chances of remaining phytase are slim, and the ability of that phytase to break down phytic acid on its own is even slimmer. This causes the vitamins and minerals to be stuck inside and passed right through during digestion. Our bodies aren’t even given the opportunity to absorb and use them. Unless you use and turn a different key – lactobacilli. Lactobacilli is the helpful bacteria found in yogurt, buttermilk, kefir and whey. It can activate phytase, giving it the boost it needs to break down phytic acid. Lactobacilli together with warm water can catapult phytase to successfully break down phytic acid in as little as 12 hours (although 24 hours are recommend by most traditional foodies). It’s a very similar process to fermentation in sourdough. What grains should be soaked? Oats, rye, barley, wheat and quinoa should always be soaked (or fermented). Buckwheat, rice, spelt and millet can be soaked less frequently. Whole Rice and whole millet contain even less phytates so it’s not necessary to always soak. Flax seed does not require soaking if eaten in small amounts. Is it really necessary to soak? She also cites a company wanting to sell phytates on their own because of their anti-tumor, anti-carcinogenic and blood sugar regulating properties. Surely something so powerful can’t be all bad, right? Besides, if an overnight soak only reduces roughly 10% of the phytic acid, is it really worth all the effort? Will it really make that big of a difference? Some say yes, that the difference between soaked grains and unsoaked grains has a profound impact on their digestive system with the latter being much more difficult to endure. Additionally, soaking can break down gluten. Those with gluten sensitivities (and those without) may tolerate soaked grains better too. But can’t we just eat white bread? If phytic acid is found only in the bran and germ, and white bread contains neither, doesn’t eating white bread solve the issue? Well, that is one train of thought to consider, but you won’t be getting the nutritional benefits of the whole grains. Essentially you’re just eating simple carbohydrates. Or what if we milled our own flour? Wouldn’t that take care of the rapidly depleting phytase? Milling your own flour does help retain the phytase. Most people that mill their own grain don’t bother with soaking since their flour is so fresh. However, milling isn’t always an option if you can’t find a good price on whole grains or don’t have a mill (you can always work around the mill problem by using this method). Ever feel like the answer isn’t ever a simple yes or no? I feel ya. Unfortunately (or maybe it’s good news? ), this topic is no different. You will have to sort out the pros and cons of soaking grains for yourself. I did some of that here –> Soaking vs Sprouting vs Sourdough. What’s your experience and knowledge on soaking? Do you soak your grains? This is the most clear explanation yet for why we soak our grains. Your similie of the locked storage container just makes everything crystal clear. Thank you. Thanks! I’m glad you found it helpful Jacqui! Interestingly, I soak my grains for my chickens. Had not thought about for my food. Hmmm… I hadn’t thought about soaking for chickens! Wonderful! We shared with our FB readers at homesteadlady.com. What a wonderful explanation! We do soak our grains probably 50%-75% of the time. It seems like there’s so much conflicting information out there about whether it’s necessary or not. I soak mainly because I am trying to heal a small cavity my son has, so phosphorous is really important and usually that is what gets locked away with the phytic acid. I can’t wait to read your next article. Thanks Sarah! If I soaked our oatmeal more often (shame on me), our percentage would be higher… but at least I’ve got the sourdough going for me! featuring your post this week!! We don’t usually soak oatmeal now that I know how little good it does, but we’re soaking or fermenting all wheat now. I love your explanation and it has reminded me that I do need to get more raw veggies in. Isn’t it interested how God seemed to design whole foods to be WHOLE but as soon as we process them they cause problems? Raw milk has lactase to digest the lactose, but we pasturize it out…. Thanks for linking up with Wellness Wednesay! Just to clarify Anjanette – soaking oatmeal does provide benefits, but each family should weigh the benefits vs. time and effort involved. Each family’s answer will be different. More raw foods are a must, and it’s is absolutely astounding at the more I learn, the more I see God’s perfect design being even more perfect from the get go! I’ve been trying to find out about soaking oatmeal. What is the problem with it and why does it apparently not help so soak it? I’ve heard that it needs to be soaked with some wheat flour to add the phytase but don’t fancy wheat flour in my porridge. Also, I have another question. With soaking, should you always use a probiotic acidic medium like yoghurt, kefir, etc? I have heard people suggest apple cider vinegar. I’ve been using the store-bought one but that’s just a normal vinegar made from apples. I’m not sure how probiotic it is. Hi Kathy! 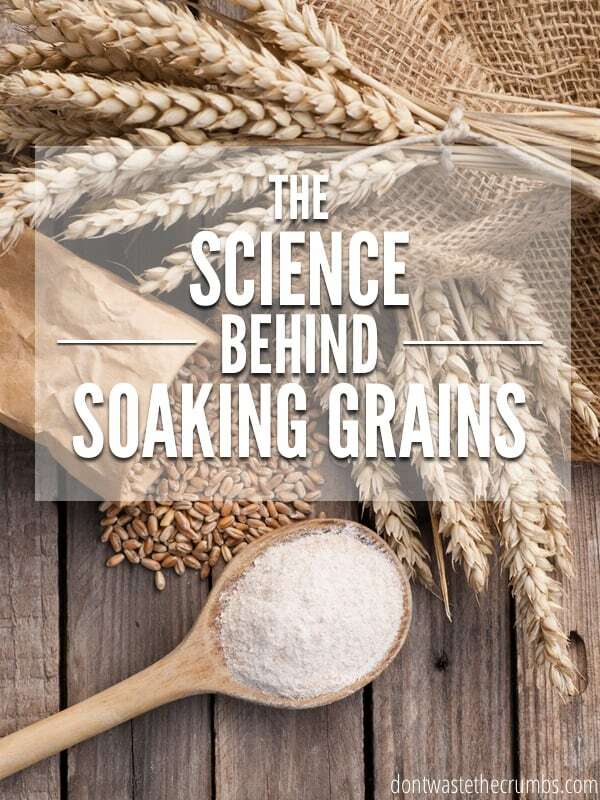 This article explains why grains should be soaked, but the counter argument is that the phytase isn’t reduced enough to warrant the soaking in the first place… the wheat adds an enzyme to help it break down even more so, but you’ll still see benefits without the addition. It occurred to me when toasting walnuts for our oatmeal that I should probably soak the nuts first. My question is, if I toast the nuts after soaking rather than dehydrating them (we love the toasted flavor and they don’t get soggy in the oatmeal) does the heat negate the good stuff from the soaking? Hi Deb! No, toasting the nuts does not negate the benefits from soaking, but it does kill the live enzymes present in nuts. If you prefer toasting anyway, and don’t care about the enzymes, you’re good to go. Otherwise, keep your oven no higher than 150 degrees to dry out AND preserve the enzymes. I wanted to add that you should avoid going above 118 degrees Fahrenheit when it comes to nuts/seeds (or most living things for that matter) in order to preserve the enzymes. It only takes about 12-14 hours in a dehydrator, but I dehydrate mine for up to three days to make sure they’re crispy and have a very long shelf-life since I sell them to the public. Do you have any sources for the research you’ve done? I’ve found tons of contradictory information on the internet regarding phytic acid and I’m trying to get to the bottom of it. Hi Angelo! I did this research quite awhile ago, so I can’t say for sure, but like you, found lots of contradictory information. The science is there – soaking does break down the phytic acid, but to which level is unknown for certain. Some people experience great benefit in (apparently) what little is broken down, so it can’t be ruled out that nothing happens! Question – You said that milled flours have little phytase left in them. What is the purpose of soaking those grains, then, if there is nothing really to activate? Also, would it be the same for store bought flour vs. freshly milled flour at home? Thanks for doing all this research; I am just beginning to learn about soaking grains! Hi Claire! For some, that little bit of phytase is enough to cause problems during digestion. As for home vs. store, I’m really not sure. In our house, I prefer to buy my own whole grains and grinding them fresh for baking than buying whole grain flour. I don’t know why, but that seems like a fair middle ground since I’m not always great at remembering to soak!! After soaking, do I have to throw away the water? Do I have to rinse the oats? Or can or should I use the water to cook the oats? I am not sure where the phytic acid goes, whether it evaporates or are still in the water used for soaking. Did you get an answer to this question? I’d really like to know as well. Hello. If rye flakes are to be used just for coating a high hydration loaf, do they still need to be soaked? TIA. At what stage do you soak the seeds/ legumes in an acidic medium? Just before you consume them? Or during the initial soaking phase which is usually followed by rinse and drain cycles that can last a couple of days? That is, do you lose the phytase during the rinse and drain cycles? You soak at the very beginning Stephen – in the initial soaking phase. I don’t know if the phytase is “lost” during rinse and drain, but I know that the levels are lower after you soak. Fermentation is best, acid is good for soaking but dairy is actually detrimental. Does using water alone for soaking help at all; or is an acidic medium mandatory? i don’t like using any mediums. Or does long(48 – 72 hours) length of smoking time help too? Ajan – soaking in general helps to quicken the cook time and MAY help with digestion, but it’s the acidic medium that does the bulk of the work. IS soaking using red or white wine vinegar good too? Thank you. I purchased the flour mill and the whole grain. Hi Feb! You CAN use red or white wine vinegar, but both tend to cost more than plain white vinegar (or ACV) and can impart a flavor into your foods that you might not like. Any thoughts on making baby cereal from home milled sprouted grains? I can’t find any information and am curious if it will be easier on her tummy. I have barley, brown rice, ameranth, millet, rye, and quinoa so it would be one those. Do you think that after sprouting, dehydrating, and milling the flour that it should be cooked? My thought is that I would want to cook it for her. I think making baby cereal from home milled sprouted grains is great! Yes, serve cooked. Serving raw would be tough on the digestion! Can the grains be soaked using the whey from making yogurt? I’m confused help? I let it lacto ferment for up to 3 days. Also – your pizza dough is lacking an important ingredient. Add either 1/2 cup kefir cheese (unsalted) or 1/2 cup thick kefir (I use 3% milk) + 2-4 Tbsp olive oil to your dough. Let it sit all day or overnight. The result will be a stretchy, incredibly tasty pizza dough. We use homemade sauce, using preserved plain tomato sauce and make a Marinara…… that will be better pizza (or as good as) than that found in Italy.